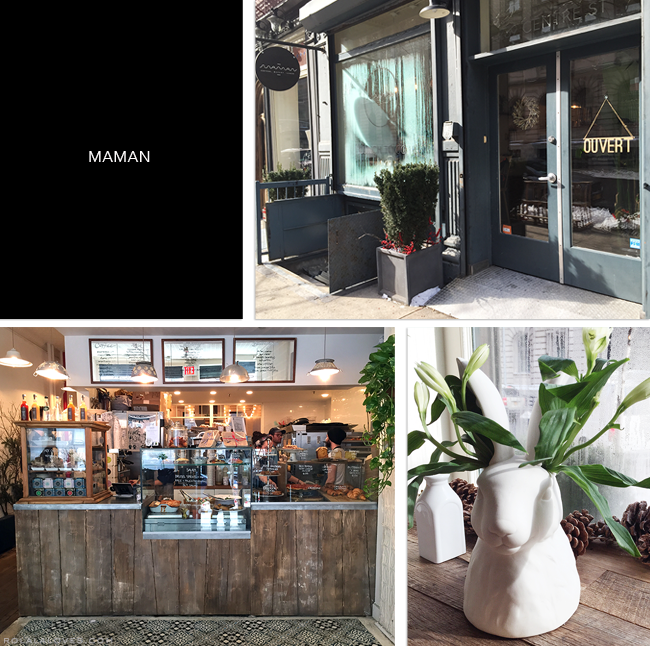 Maman is a charming café/bakery on Centre Street that I've been frequenting quite often especially lately. The rustic and eclectic space with whitewashed brick walls and distressed wood floors is quaintly decorated with bunny figurines, vintage photos and mix and match ceramics. The back dining room has the comfort of sitting in someone''s chic French country style home which is apt since "maman" means mother in French. With Michelin starred French chef Armand Arnal in charge, the food is solid as well. The menu features a revolving selection of family inspired French and American home cooking recipes. Savory options include quiches, salads, sandwiches, soups and seasonal specials like ratatouille, lasagna and shepherd's pie. Everything I've tried (see below for pics) has been fresh and delicious. I've noticed that a number of their daily offerings are usually vegetarian friendly as well. The bakery serves up an assortment of breads and pastries throughout the day and they're well known for a most delicious chocolate chip cookie. I can't attest to it since I don't really eat cookies but my friends who've tried it say it's pretty darn good. I have broken my ban on sweets for their Nutella madeleines and it's worth it! They serve Toby's Estate Coffee and Sloane Tea and these beverages come in the prettiest printed cups. I'm a fan of their matcha almond lattes and I'm looking forward to trying it cold as the weather warms up. The staff is usually friendly though there can be some frenzy during the lunch rush. You can dine in or take out so if you happen to be in the neighborhood, I'd recommend stopping by. The food looks so good! I wish I could try a Nutella madeleine! Wow nice place!!! delicious post!!! A great find and the food looks amazing. I want to eat everything!! Ooh I will definitely try those madeleines as well! But I would really want to try the different quiches and sandwiches. I love cozy, French dishes! That looks like a great place to dine in, Rowena and you weren't kidding about the food. They look really good and I could almost taste them through your pictures. Wow, everything looks incredible and so delicious. Looks like a really lovely place, the interior design alone already looks really inviting. This place looks so cute and sounds so yummy!!! The place is so beautiful! Hope you have a lovely day. wow this place really looks amazing!!! the whole environment is so trendy and the food looks delicious :) Thanks for sharing! Great post, lovely place .-) I love your blog! Would you like us to follow eachother on GFC and keep in touch? This space is so inviting...I love all the rustic elements! 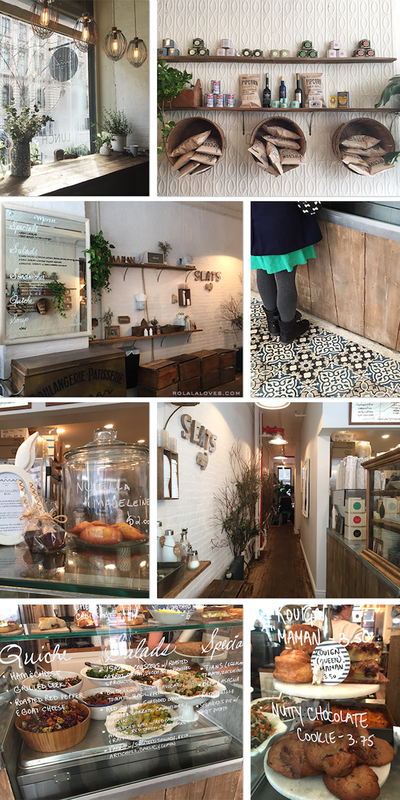 Beautiful cafe! It definitely looks like a little charming place that I would like. I love the cosy decor. Such a cool bakery! Yummy food. I love their light fixtures and the writing on the glass. Rowena, they offer so many wonderful things for a small cafe. Loving the options! Oh I think this is not far from where I work. I will have to take a stroll by, there if just for how it looks! This place looks absolutely charming! I think this French chic decor goes perfectly with the dishes you described. The menu seems quite varied and I like that. It is always good to have a selection of vegetarian meals because even people who are not vegetarians might enjoy a change. thank you for sharing and I wish you a blessed day ahead! This looks a fabulous café and just my kind of place. I love everything about it including the gorgeous tiled floor. The savoury selection appeals to me and I would definitely have a madeleine! If only I lived closer! The place looks amazing! It looks so rustic and cozy, I just love it! I love the interior, and need I say a word about the food? It look so good! The food looks delicious, and I love the bunny decor! I have heard of this place but I have never been. Just look at that food. I am so hungry right now lol. I just love all the photos. This really is a great post. Amazing place, everything looks delicious ! oooohhh Rowena! I love the decor and ambience, very relaxing and cosy and based on what you have described, they basically cover almost everything in the menu one can possibly eat (that's why perhaps one has to go back again to try more of other dishes!). Oh boy, the more I look at the pics, the more it makes me wanna just drop in there NOW!! thanks for sharing. Hope you are having a fabulous week, my friend.